On Jan. 30, the annual Bell Let’s Talk Day, an advertising campaign created by Bell Canada, took the country by storm. In an effort to raise awareness and combat stigma surrounding mental health in Canada, Bell donated money to mental health funds for every social interaction with campaigns hashtag. While the world tweeted, snapped and Instagram-ed away, The McMaster Women’s Athletic Leadership Committee took it one step further and hosted their first-ever Bell Let’s Talk event. 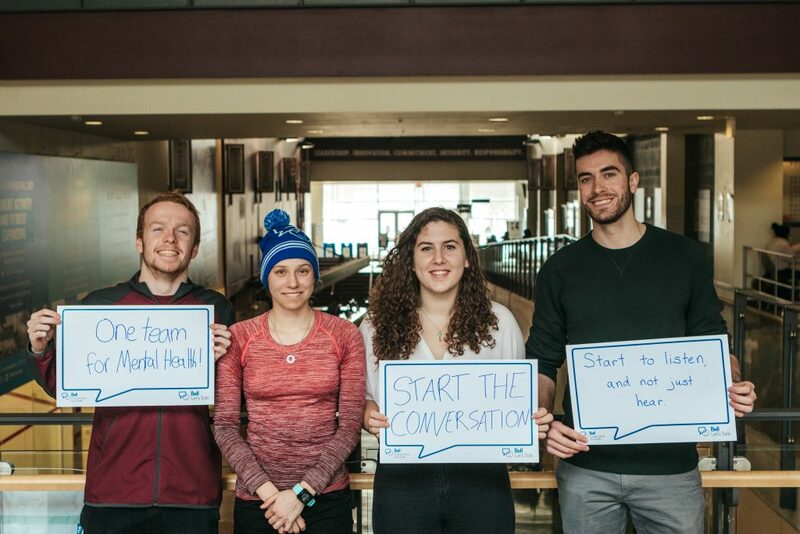 The event consisted of McMaster student-athletes sharing their personal stories in an open and safe environment that was open to the entire McMaster community. Five student-athletes, Sabrina Schindel, Allison Sippel, Aurora Zuraw, Nicolas Belliveau and Louis Sharland, took the floor and led discussions on depression, eating disorders, language and anxiety and men’s mental health. The event was a success with a great turn out that included open discussion and much-needed conversations on mental health and how it affects athletes, in addition to the right steps that need to be taken to combat different stigmas. “At first, I was expecting it to be a small event with just members of WALC, but to have my teammates, friends and people I didn’t even know come out to support was so amazing and inspiring,” said Sippel, the initiator for the event. The idea for the event came up after Sippel, a cross-country runner, wanted to be able to create an open space for people to be able to talk about their battles with mental health. “I feel like if we are able to create a space where people are open to talking, there would be less of a stigma around it,” said Sippel. She first wrote down her story after she got out of the hospital after suffering from an eating disorder. After reading it to her close friends and family members, she never really shared it with the public. But when the idea of creating an event for Bell Let’s Talk came up, the idea of the panel sharing personal stories came to mind. Working with Claire Arsenault, McMaster’s Athlete Services Coordinator and WALC, the panel that would originally be a conversation for members of the committee grew to more. “I was happy that male athletes joined in and it was really inspirational that the group of us could be able to share our stories,” said Sippel. Each speaker shared their story then opened up the floor for discussion, answering questions in regard to their experiences, advice for others and much more. During the panel, Sippel shared her story about how her eating disorder led her to be hospitalized when she was 14 years old. After losing too much weight and no longer being allowed to run, her journey to bounce back was not easy. “This illness had turned mind against body and person against person because nurses were trained to trust no one,” Sippel explained about her time in the hospital. Eventually, Sippel showed signs of improvement and was allowed to leave the hospital and return to her everyday life. Fast-forward to today, and she is now running on the Mac cross-country team while trying her best to stay on top of her condition. “It’s a lifetime of fighting against my mind so I never had to go back,” Sippel said. For Sippel, having the student-athletes lead this conversation was important for a number of reasons. Schindel, another one of the five student-athletes who shared their stories, is a lacrosse player who suffered from depression. Through the ups and downs of dealing with her battle, she eventually discovered that staying busy and active is what kept helped her out the most. This meant that when her lacrosse season was over, she would have to find something to keep her occupied so she did not fall down that dark hole again. “Realizing that no one is beyond help and getting in front of my depression before it could do the same damage it used to,” Schindel explained as the steps she takes to keep herself from falling again. Schindel’s story, though devastating, is more common amongst young people than one may think. This is why it is so important that these conversations are happening. 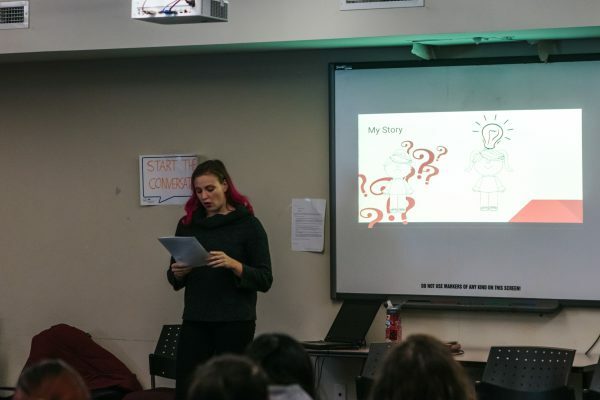 Having the bravery to start the conversation, and sharing tips and resources with their fellow students is a great way for Marauders to do their part in helping end the stigma surrounding mental health.